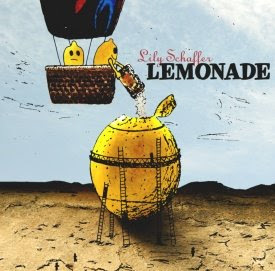 Lemonade, the debut album by Chicago singer-songwriter Lily Schaffer, is perfectly named. It’s both sweet and sour, pairing airy pop melodies with tales of unhappiness and imperfection. This cocktail of sweetness, sadness and clever cynicism makes it clear that Schaffer has studied under the school of Aimee Mann, the reigning queen of unhappy-yet-hummable pop. For proof, just listen to album opener “Rubber Match” - which both musically and lyrically sounds like it could have jumped straight out of Mann’s catalog. Although the similarities are hard to ignore, Schaffer manages to avoid coming off merely as a disposable knockoff of the original. Her sugar-coated vocals sound a bit more ingenuous and the material is too good to ever seem irrelevant, consistently offering quality hooks, grade A performances by Schaffer's band and excellent, Jon Brion-esque production. The melodies of whimsically sad cuts such as “All He Wants,” “Nebula” and “Firecracker” are lush and immediately satisfying, and Schaffer keeps things interesting by spacing out the slower tracks with more upbeat, assertive material such as “Trigger” and “Pun,” which add some Liz Phair influence into the mix. All of these ingredients add up to create a strong debut that should appeal to any fan of literate alt-pop. Lemonade is available for download here. For more information, check out our recent Q&A with Schaffer. Also, be sure to catch a live performance and interview May 31 on Chicago Rocks, set to air on Channel 25 at 7 p.m..